As we seen the 120 received the Holy Ghost. Acts 2:38 Peter stood up on the day of Pentecost and said that we must repent and be baptized in the name of Jesus Christ for the remission of sins and ye shall receive the Gift of the Holy Ghost. Verse 39 says for the promise is unto you and to your children and to as many as the Lord shall call. Jesus Christ had to ascend back to Heaven for the Comforter to come. The comforter is the Holy Ghost. They received the Holy Ghost with the evidence of speaking in tongues. 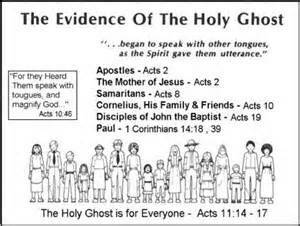 I was raised in an Apostolic Pentecostal church and when someone receives the Holy Ghost they are not speaking in a language that they know. They are speaking in a language that only God can understand. Receiving the Holy Ghost is God’s spirit living within us. When we receive the Holy Ghost it’s as if God is putting his stamp on us and when he comes back for his bride he will know who is his because he put his stamp on us.